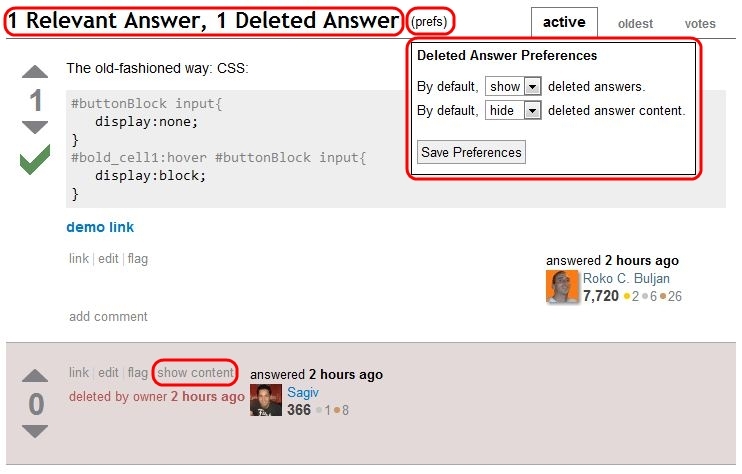 This script hides the content of deleted answers (which are visible to 10k+ Stack Exchange users), injects a show content / hide content toggle in the answer's menu, and injects a visibility toggle for all hidden questions into the page. Based on a few comments below, as of June 2017 I have updated and republished the Chrome extension. If you like/use the extension, please rate it in the Chrome store. Additionally, before UserScripts.org shut down, the script saw a lot of activity there. If a similar site has taken its place in popularity, please let me know in the comments below so that I can post it there as well. This script is now available as a Google Chrome extension. Script now aborts if there are no deleted answers. Relevant answer text now only shows if there are relevant answers (showed 0 before). After settings change, users is prompted to reload page. 1.4 - Deleted answer manager now works on all StackExchange sites. 1.3 - Fixed HTML injection, updated to latest jquery. 1.0 - Added link for Google Chrome extension. 1.0 - Modify the page only if deleted answer(s) exist. 0.9 - Fixed bug in show/hide content logic. 0.8 - Added ability to save preferences using localStorage. 0.7 - Initial post on Stack Apps. Browse other questions tagged script chrome-extensions 10k-tools .